There it was, sitting on the flea market table between the waffle iron and the stapler. A Lordox 35mm camera just like the one I had back in the Fifties when we took that diving trip to Mexico. No rangefinder, just a viewfinder and a focus scale on the lens. Guess the distance and hope the picture is in focus. No automatic exposure compensation, no light meter, just barely more than a box camera. That one had been a poor replacement for my stolen Rolleicord. I picked it up. It did not have the feel of my later cameras. But it was in surprisingly good condition. I wondered if 50 years hence any current digital camera would still be working. If memory cards for it would have gone the way of film. I held the viewfinder up to my eye. 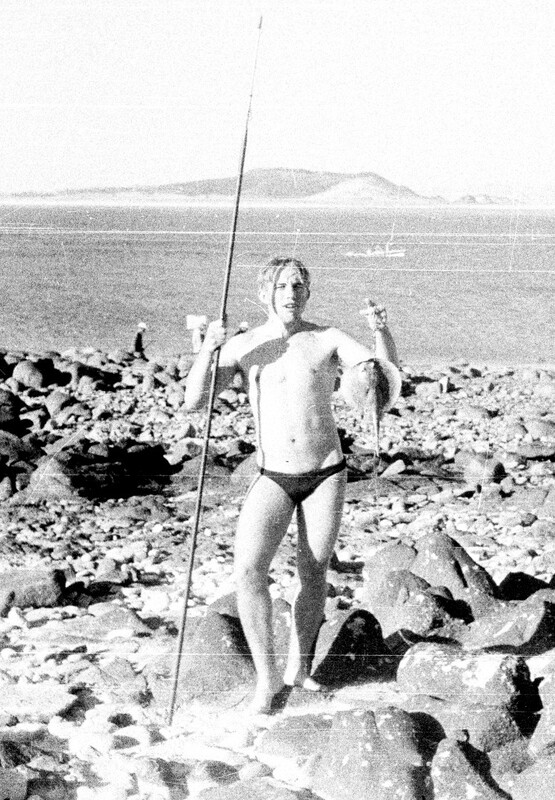 There was Don, standing with his back to the Gulf of California holding a fish in one hand and a spear gun in the other. His mask was pushed up on his forehead. He was smiling broadly. I turned the camera to the right and there was Bud, lying on his sleeping bag looking over the surf near Big Sur. Another sweep to the left and there was Jim in the distance just getting out of the water at the breakwater in Monterey Bay. The flea market vendor was talking to a potential customer. I rotated the film advance knob and the take-up spool moved in unison. There must be film in it. Waiting vainly to capture some moment. I cocked the shutter and pushed on the shutter button. It fired. It was 1958. We had been skin diving for about three years with weekend trips from Oakland to Monterey. We dove in the harbor around the breakwater, and in various beaches and coves along the ocean south of Monterey. Skin divers still relatively rare and were still novel to the public. The suits, masks, snorkels, fins, spear-guns and other paraphernalia would provoke curiosity, stares, questions and sometimes hostility, especially if we were on one of the public docks. Except for the occasional hostility we relished the attention, its invigoration. Trips from Oakland were still an effort without the freeways that came later. Most trips started late Fridays so we could have a full day Saturday and almost full day Sunday. During the days we dove. Access to the beaches was not so guarded as the later divers found. Most of us did not have aqua-lungs which were still very expensive and rare. Without SCUBA equipment we mostly were limited to what we could do by holding our breath and diving. Our diving abilities went from mediocre to great, with mine falling somewhere near the bottom of our group. The primary measure without SCUBA gear was “working the bottom” near the breakwater in the harbor at Monterey. A good diver could dive to the bottom, around fifty feet down, and swim around looking for a fish to spear before having to surface for breath. The measure was implicit and self imposed, no one charted the ability. One-up-man-ship and our youthful “ranking”, as we called our banter, stopped at waters edge. We were glad to be part of something and stuck together. In the evenings we camped out on various beaches, mostly at what we called Monastery beach after the Monastery across Highway One. Often we went further south to beaches with names we assigned, like “Conger Cove” of course named after our skin diving club, the “California Congers”. Sometimes we went inland to Carmel Valley and camped on the river, That area was then still undeveloped and had a nice country feel. Other campgrounds included under a bridge, on Highway One, and “Deer Flats”, a public park area above the city of Monterey. We were on the edge and we knew it, and mostly we relished being outliers. The ocean around Monterey was pretty chilly, even in the bay, because the California Current up-swelled off the coast bring cold water from the deep channels. The coldness of the water, laden with nutrients, made the underwater life rich. There were large kelp beds and fish were abundant. It was not uncommon to be visited by a sea otter, curious about this interloper in it territory. Abalone was still abundant and easy to find in relatively shallow water. I once harvested an eleven inch abalone (fairly large, not huge) in water about eight feet deep at the northern end of the beach in downtown Carmel twenty feet from the public beach. The popularity of diving which came later made such feats almost impossible. The coldness of the water was one inspiration for the trip to Mexico. The water of the coastal areas was in the low fifties Fahrenheit and in the bay somewhat warmer. The coldness called for some sort of diving suit if you planned for any extended stay in the water. The wet suit, mainstay of modern diving, was just becoming available but was very expensive. A wet suit works by using body heat to warm a thin layer of water next to the body, keeping the diver warm. Most of us still used what was called a “Dry Suit” but which we renamed “Dry Type Suit”. The theory of the dry suit was that the rubber suit, essentially just a huge body condom, kept the water out and warmth was provided by insulating layers of typically “long johns” underwear. That was the theory, the reality was somewhat different. The smallest pinhole would let in the cold water and the underwear absorbed it. Dry suits were rarely dry and the leaks shortened the time you could comfortably stay in the water because the water soaked underwear easily sapped body heat out to the ocean. The cold was a big factor in the increasing popularity of wet suits. I could not afford a wet suit so I relied on a dry suit. Putting on the dry suit was awkward at best, time consuming at worst, and usually a waste of time. Long dives were a rarity so I was one of the proponents of what we called “radical diving”. The name was just an attempt to make a silly idea seem special. Radical diving was simply diving without either a wet suit or dry suit, usually just an ordinary swim suit. My reasoning was “if my dry suit leaks and I can only stay in for twenty or thirty minutes why should I spend twenty or thirty minutes suiting up for thirty minutes of diving, why not just go 'radical' and save the time suiting up?”. Of course radical diving was COLD diving but at least any agony was over quickly and you did not have a bunch of wet underwear to dry out around the campfire. OK the shutter worked, how about the self timer. I pushed the self timer lever, it was stiff but finally moved, I wound the film again, cocked the shutter and pushed the shutter release. The self timer lever started moving and making an irregular sound, like it needed lubrication. It was slow but finally triggered the shutter. I was not alone in my aversion to cold water. We all knew the water of the Gulf of Baja was much warmer and some of us wanted to give it a try. The Gulf of California was big in the lore of our diving group. John Steinbeck had written about it in his book “Log from the Sea of Cortez” about his trip with Ed Ricketts in the Forties. The book had a special status with the group. I had never read the book but thought it best to show proper reverence when it was mentioned. The lore of the Gulf and the idea of diving without having to “suit up” was appealing so four of us from our group of twenty or so, Jim, Bud, Don and I hatched the idea for the trip to the Gulf of California in Mexico. The plans for the trip were like none of our weekend trip plans. Jim did the research and lobbied for Puerto Penasco, near the top of the Gulf of California, just below the Arizona border. As often happened we went with his idea. His enthusiasm often trumped logic or sense. We often followed his lead not because he was a leader but more because he was a pathfinder. He read a lot and had no doubt come upon an article in a skin diving magazine extolling some feature of the location. Puerto Penasco was just few miles down from the Arizona-Mexico border via what we hoped was a reasonable highway on the Mexico side. This was to be a week or two and would take some planning. We assumed we would be mostly away from any kind of store so we started planning “The Menu”. Fresh food was going to be limited so canned food was to dominate the menu. For the travel until we reached Mexico we would have stores and restaurants along the way but once we reached the ocean we planned to rely on what we would bring, mostly canned food. None of us had more than basic cooking skills, really just “open can; heat”. We would have loved to have had Dusty come along but he and his well know cooking skills would not be on the trip. I do not remember all of the items on the menu but they were at best basic. The non-menu planning was mostly a mirror of weekend trips, diving gear and camping equipment. None of us had passports so temporary visa had to suffice. A diving buddy was in the Coast Guard and was a medic so in order to save money, I prevailed on him for one of the shots recommended for travel into Mexico. In a small bit of intrigue I met him just outside of the entrance to Coast Guard Island, between Oakland and Alameda, where he smuggled out a hypodermic with the needed shot where he gave me the injection. The preparations for the trip ended and the trip began. In spite of all the possible snags the trip there was essentially uneventful; no car trouble, no bandidos, no drama. We arrived at Puerto Penasco, or more correctly at the beach near the village. We came to dive, not sightsee. After diving in the Monterey Bay area we were looking forward to the warm water. The water was warm. After having done most of our diving in water with temperature in the low fifties it was nice to just jump into the water and not worry about suiting up in cold water gear. However “jumping in” was somewhat mis-stating the situation. Where we were was almost the northernmost tip if the Bay of California,. It was very shallow and getting into the water was more wading. Where we camped was at the waters edge at high tide but about seventy feet from the waters edge at low tide. Getting out to the deeper water at high tide meant wading, while at low tide it took a trek over the rocky beach. The water deepened gradually but still was shallow compared to our home diving base. After diving on the California coast the diving in the Bay of California was disappointing. Aside from the shallowness of the water there was the limited sea life. No kelp beds, no reams of life, just mostly sandy bottom with the occasional sting ray hiding in the sandy bottom. Large expanses of the beach were fully exposed during low tide and in very shallow water at high tide so any fish there tended to the small side. Unlike the California coast the likelihood of a shark or Orca was very small. In the water around Monterey there was always the remote chance of meeting a shark or even more remote chance of encountering an Orca, more commonly called a Killer Whale. One had cruised Monastery beach about 200 feet off shore within a minute after one of our group left the water, much to our concern. We expected no such problem in the Gulf. My closest brush with even a remote danger came in about three feet of water. While paddling around near out campsite I saw a small colorful fish casually swimming above a rock grouping. It was too small to think of spearing so I just poked at it to scare it back to its lair. No flight, no scurrying, no panic. It just stayed where it was. As colorful as it was I knew it was not trying to blend into its surroundings so why did not it try to escape. Something in me mused, maybe a primitive self-preservation instinct mused “it must not be afraid of me for a reason; maybe it knows something I do not.” Whether luck or just some primitive impulse I thought “Okay, I will just leave it alone.” I later saw a picture of a fish that I identified as the one I met. It was a “Lionfish”, a very poisonous fish, dangerous to touch because of its poisonous spines. With the diving not living up to expectations the only excitement was the “Great Menu Revolt”. About the third day on the beach when the subject of the evening meal came up Jim stated “I am going to have Spam and corn”. Jim took his position in the hierarchy very seriously and would not back down. Spam and corn was not on the menu for that evening. What to do? So occurred the “run on Spam and corn” and all stores of Spam and corn were exhausted before bedtime. It was not like anarchy broke out but anything previously planned lost its immutability. Another day or two; the diving had not been great, so “to hell with it”, lets pack up and try something else. The something else was the pacific side of Baja California south of Ensenada at a place called Punta Banda. We packed up and drove there and set up camp on a bluff overlooking the Pacific Ocean. Lots of sunshine, no shade, short walk down to waters edge. Back on the Pacific side, we reasoned, there would be more to see and experience. Punta Banda while as far south as Puerto Penasco did not mean warm water. As it turned out at that location on the Pacific shore has a deep undersea canyon right off the shore, which brought very cold water up from the deeps of the California current. Back to cold water diving. No “dry type suit” in the equipment I brought. Only one thing to do, take a Radical dive. So came my second brush with danger. Not an Orca or shark or Lionfish. Skindiving was still a relatively new sport. Knowledge was both limited and mis-interpreted. None of us had ever heard the word hypothermia, extreme loss of body heat. I was soon to get an introduction. Determined to get in some diving I went in with only mask, fins, snorkel and swim suit. I swam around for a while, braving the cold water, till I had enough. I knew I was cold, I had been cold on dives before. This time it was different. I was really cold. I got out of the water shivering. I had shivered before; this was different, I was really numb. I went up to the camp site in that bright sun; crawled into my sleeping bag lying in the hot sun and stayed in there till sunset. It took that long, about eight hours, for my body to build up its heat reserves. That brief introduction to hypothermia was it for me. The next day I passed on the diving. The day after that we went home. The trip home was uneventful. There was no excited talk about the things we had seen or almost speared. We all had to go back to work or school. When we arrived home the lack of hype was witness to the trip not living up to expectations. The diving was much more interesting in our home waters. The disappointing diving on the trip, the cold water upon return home contributed to a decline in my interest in diving. Even before the trip my enthusiasm for diving was waning; other visions beckoned. I was attending San Francisco State College and majoring in Photography and it was taking precedence over diving. I took fewer diving trips after that and by the time I went into the Army the next year my diving days were over. “How much for the camera?” I asked. We settled on $10.00.